A council has been forced to pay a family's £10,000 rent arrears after leaving them in an "unaffordable" flat for more than six years. Basingstoke and Deane Borough Council left the family facing "stressful" eviction proceedings, the Local Government Ombudsman ruled. It said the father and two daughters were only offered a single room in a hostel as an alternative. The council has also been ordered to pay them £4,500 in compensation. The unnamed father gave up his life abroad at short notice to look after his children when they were removed from their mother's care in 2012, ombudsman Michael King said. The council placed them in a three-bedroom private flat costing £850 a month. Later the rent rose to £1,025 but the family's housing benefit fell at the same time due to the government's benefits cap, Mr King said. The ombudsman said the council denied the family a right of review and caused them "distress". "Had the council acted properly in this case, it would not have had to pay a significant sum to the private landlord to make up the difference in the rent," he added. Mr King ordered the council to apologise and to place the father, who still lives in the flat, at the top of the list for each eligible property he bids for. 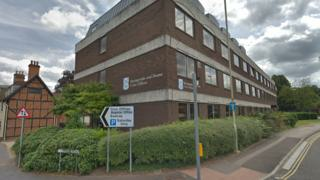 Basingstoke and Deane Borough Council said it would now consider the report, but could not comment on individual cases.